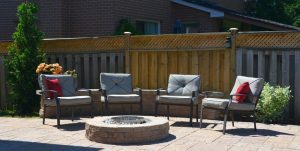 We can help you complete your backyard oasis design by incorporating the elements of fire and water. Provide campfire charm with an outdoor firepit. Cook over open flame, gather with friends and family or simply provide some extra warmth on a chilly night. Available with wood burning or propane inserts in a variety of shapes and sizes to blend into your landscape design. Water features provide calm and soothing in an outdoor oasis. 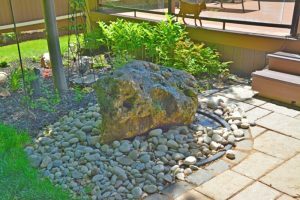 Bubbler rocks combine visual interest, the soothing sound of flowing water and a lifetime of durability. Your unique rock is selected to meet your size, dimension and color desires. Why Choose Earthworks Landscaping for Firepit and Water Feature Installation? While there are a number of landscaping contractors to choose from, earthworks landscaping is a locally owned, family run business with over 10 years of experience in landscape construction in the Burlington & Oakville area. We are committed to providing the outdoor space you desire with quality workmanship we stand behind. As a result of our commitment, we have an industry-leading warranty. We will arrange for one of our landscaping specialists to visit your property. We will discuss your vision and collect the information we require to provide you with an estimate.